This is the third in an occasional series called “Cobb County history through documents,” and is the text of the act of the Georgia legislature that created Cobb County in 1833. Cobb was created, along with nine other counties, from Cherokee County and parts of Hall and Habersham counties. This document was retrieved from the Georgia Legislative Documents initiative, which is available through GALILEO on the Cobb County Library website. ACTS OF THE GENERAL ASSEMBLY OF THE State of Georgia, PASSED IN MILLEDGEVILLE AT AN ANNUAL SESSION IN NOVEMBER AND DECEMBER, 1832. Full Title: AN ACT to add parts of the counties of Habersham and Hall to the county of Cherokee, and to divide said county of Cherokee into ten counties and to provide for the organization of the same. Sec. 1. Be it enacted by the Senate and House of Representatives of the State of Georgia in General Assembly met, and it is hereby enacted by the authority of the same, That so much of the counties of Habersham and Hall, as lies west of a line beginning at the Mouth of Leathers’ Spring Branch, in said county of Hall, and running up said branch until it crosses the road leading from Leathers’ Ford to Habersham, by way of George Garmons — Thence with said road to the fork of Tessentee road — thence with said Tessentee road to the Habersham line — thence with said line to a line dividing lots number twenty-four and twenty-five, in the first district of said Habersham county — thence due north to a line dividing the first and fourth districts — thence west to a line between lots numbers forty-eight and forty-nine, in said fourth district — thence due north until it intersects the line of the county of Cherokee; shall form and become a part of Cherokee county. Sec. 2. And be it further enacted, That the first, second, third and fourteenth districts of the first section of said county of Cherokee, shall form and become one county, to be called Forsyth. Sec. 3. And be it further enacted, That so much of the said county of Cherokee as lies within the fourth, fifth, twelfth, thirteenth, fifteenth, and such parts of the sixth and eleventh districts of said first section, as lies south of the mountains, to be more particularly designated by a line hereafter to be run including such parts of the counties of Hall and Habersham herein-before added to said county of Cherokee, shall form and become one county, to be called Lumpkin. Sec. 4. And be it further enacted, That the seventh, eighth, ninth, tenth, sixteenth, seventeenth, eighteenth and ninteenth, and so much of the sixth and eleventh districts of the first section, as lies north of the mountains, and of the before-mentioned line to be run, shall form and become one county, to be called Union. Page: 57of the second section, and so much of the first, second and third districts, as lies east of a line to be run, commencing at the centre of the north line of the third district in said third section and running due south to the south line of the first district in said section, shall form and become one county, to be called Cobb. Sec. 6. And be it further enacted, That the second, third, fourth, thirteenth, fourteenth and fifteenth and such parts of the twenty-third, twenty-second and twenty-first district of the second section as lies east of a line to be run, commencing at the centre of the north line of the twenty-third, and running due south to the south line of the twenty-first district, shall form and become one county, to be called Cherokee. Sec. 7. And be it further enacted, That the fifth, sixth, seventh, eighth, ninth, tenth, eleventh, twelfth and such parts of the twenty-fourth and twenty-fifth districts as lie east of a line commencing at the centre of the south line of the twenty-fourth, and running due north to the north line of the twenty-fifth, and so much of the twenty-sixth and twenty-seventh districts of said second section, as lies east of a range of mountains running north and south through said district, shall form and become one county, to be called Gilmer. Sec. 8. And be it further enacted, That such parts of the twenty-seventh, twenty-sixth, twenty-fifth and twenty-fourth districts of the second section, as lie west of the lines herein-before designated, and the seventh, eighth, ninth, tenth, eleventh, twelfth, thirteenth, fourteenth, twenty-fifth, twenty-sixth, twenty-seventh and twenty-eighth districts of the third section, and the sixth, seventh, eighth, ninth, tenth, eleventh, twelfth, thirteenth, eighteenth and nineteenth districts of the fourth section, shall form and become one county, to be called Murray. Sec. 9. And be it further enacted, That such parts of the twent-first, twenty-second and twenty-third districts of the second section as lie west of the line herein-before designated, and the fourth, fifth, sixth, fifteenth, sixteenth and seventeenth districts of the third section, shall form and become one county, to be called Cass. Sec. 10. And be it further enacted, That the twenty-second, twenty-third and twenty-fouth districts of the third section, and the third, fourth, fifth, fourteenth, fifteenth and sixteenth districts of the fourth section, shall form and become one county, to be called Floyd. Page: 58Sec. 11. And be it further enacted, That so much of the first, second and third districts of the third section, as lies west of the line herein-before designated, and eighteenth, ninteenth, twentieth, twenty-first districts of the third section, and the first, second and seventeenth districts of the fourth section, shall form and become one county, to be called Paulding. Sec. 12. And be it further enacted by the authority aforesaid, That on the first Monday in March next, the persons who may be resident in said counties, entitled to vote for members of the Legislature, may meet together at the several places herein-after designated in their respective counties, and under the superintendance of three suitable and capable persons, elect five justices of the Inferior Court, a clerk of the Superior and Inferior courts, a Sheriff, a Tax Collector, a Tax Receiver and a county Surveyor, and Coronor for each county — who shall hold their respective offices, for and during the time hereinafter prescribed in the seventeenth section of this act. In the county of Forsyth, at the place where William Hammons now lives. In the county of Lumpkin, at the place where William Dean now lives. In the county of Union, at the place where Isaac N. Greer now lives. In the county of Cobb, at the place where John Pace now lives. In the county of Cherokee, at the place where John Lay now lives. In the county of Gilmer, at the place where Ned Tucker recently lived. In the county of Cass, at the place where Chester Haws now lives. In the county of Murray, at New Echota. In the county of Floyd, at the place where James Cunningham now lives. In the county of Paulding, at the place where John Witcher now lives. Page: 59of such officers throughout the State, except as provided for in the thirteenth section of this act. Sec. 15. And be it further enacted, That the Justices of the Inferior courts in their respective counties or a majority of them, shall designate the site for the necessary county buildings as they may think most conducive to the public good, and they shall have power of erecting all necessary county buildings. Sec. 16. And be it further enacted, That the said Justices shall, as soon as practicable lay off their respective counties into Captain’s districts, and when said districts may be defined, they shall advertise, and one or more of said Justices shall superintend the election for two Justices of the peace in each Captain’s district, giving fifteen days notice of said election at two or more public plaees in said district, which said justices of the peace when elected, shall be commissioned by the Governor. Sec. 17. And be it further enacted, That the county officers elected under, and by virtue of this act, shall be commissioned for, and hold their offices until the first day [of] January then next, and until their successors are elected and qualified and no longer. And be it further enacted, That an election shall be held on the first monday in January eighteen hundred and thirty-four, at the various places for holding elections in the said counties for all county officers in said counties in terms of the law now in force in this State, and the persons elected are to be commissioned, and hold their several offices so as to end at the same time that the commissions of the county officers of the old counties of this State will end, according to the laws now in force, so that all the county officers in this State may be hereafter elected at the same time. Sec. 18. And be it further enacted, That it shall be the duty the said justices of the peace, after they shall be commissioned by the Governor as aforesaid, to advertise in their respective districts an election for [Illegible Text] and subaltern officers as required by the militia laws now in force; and said Captains shall as early as practicable make out a complete roll of all such persons in the respective districts as are liable to do militia duty, and return the same to the inferior courts. Page: 60counties shall be elected and commissioned, it shall be the duty of the justices of the inferior courts to advertise the election of field officers for each county, giving fifteen days notice thereof in one or more public places in each captains district — and it shall be the duty of two or more justices of the peace to superintend said elections and certify the same as required by the militia laws now in force. Sec. 20, And be it further enacted, That the justices of the inferior courts of the respective counties shall, as soon as practicable proceed to the selection of grand and [Illegible Text] jurors in the manner pointed out by the laws now in force. Sec. 21. And be it further enacted, That it shall be the duty of the county Surveyors jointly, of the counties between which according to the provisions of this act lines are to be run and marked, under the order and direction of the respective inferior courts, with such aid as they may grant, to run and mark said lines, and to return to their respective courts plats thereof plainly designating the said boundary lines which plats shall be by the Clerks of the Inferior Court placed upon the county records. Sec. 22. And be it further enacted, That the several counties hereinbefore organized, shall form and become a judicial circuit to be called Cherokee — and that so soon as may convenient after the passage of this act there shall be elected for said circuit a Judge of the superior courts, and a Solicitor General. In the county of Cherokee, on the second Monday in February and August in each and every year. In the county of Forsyth, on the third Monday in February and August in each and evey year. In the county of Lumpkin, on the Thursday after the third Monday in February and August in each and every year. In the county of Union, on the fourth Monday in February and August in each and every year. In the county of Gilmer, on Thursday after the fourth Monday in February and August in each and every year. In the county of Murray, on the first Monday in March and September in each and every year. In the county of Floyd, on the Thursday after the first Monday in March and September in each and every year. 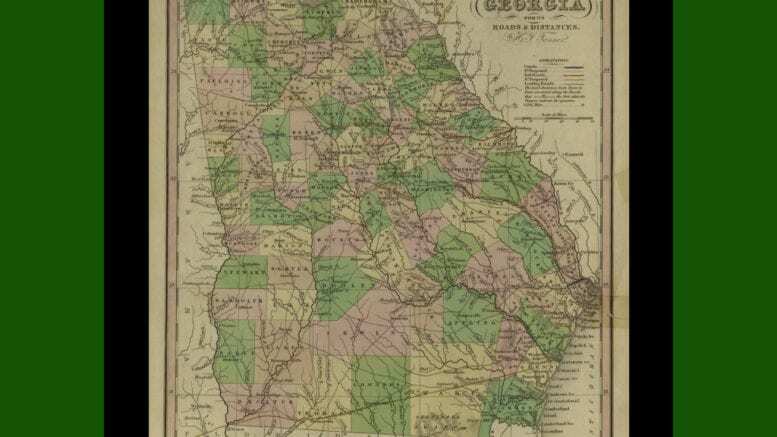 Be the first to comment on "1833 — Georgia legislature forms Cobb County"